Revenue in the eCommerce market amounts to US$3,751m in 2019. Revenue is expected to show an annual growth rate (CAGR 2019-2023) of 11.4%, resulting in a market volume of US$5,776m by 2023. The market's largest segment is Electronics & Media with a market volume of US$1,014m in 2019. User penetration is 62.5% in 2019 and is expected to hit 64.2% by 2023. The average revenue per user (ARPU) currently amounts to US$185.06. The eCommerce market encompasses the sale of physical goods via a digital channel to a private end user (B2C). Incorporated in this definition are purchases via desktop computer (including notebooks and laptops) as well as purchases via mobile devices such as smartphones and tablets. The following are not included in the eCommerce market: digitally distributed services (see instead: eServices), digital media downloads or streams, digitally distributed goods in B2B markets nor digital purchase or resale of used, defective or repaired goods (reCommerce and C2C). All monetary figures refer to the annual gross revenue and do not factor in shipping costs. Reading Support Revenue in the eCommerce market amounts to US$3,751m in 2019. Reading Support The eCommerce market is expected to show a revenue growth of 18.7% in 2020. Reading Support In the eCommerce market, the number of users is expected to amount to 21.9m by 2023. 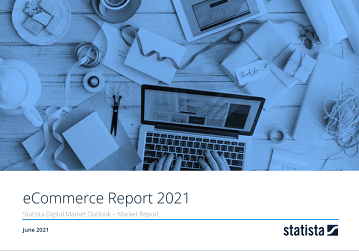 Reading Support User penetration in the eCommerce market is at 62.5% in 2019. The “User” box shows the number of active paying customers (or accounts) of the selected market (market segment, region) in millions for each year. The “Penetration Rate” box shows the share of active paying customers (or accounts) from the total population of the selected market (market segment, region) for each year. Reading Support The average revenue per user (ARPU) in the eCommerce market amounts to US$185.06 in 2019. The “ARPU” box shows the average annual revenue per paying user of the selected market (market segment, region) for each year. Reading Support With a market volume of US$718,389m in 2019, most revenue is generated in China. Reading Support In the year 2017 a share of 34.3% of users is 25-34 years old. Reading Support In the year 2017 a share of 51.4% of users is male. Reading Support In the year 2017 a share of 36.4% of users is in the high income group. The Users by gender box shows the gender distribution of users of the selected market (market segment, region). The data is based on Statista's Global Consumer Survey. Data for countries that are not included in the Global Consumer Survey refer to the corresponding region. Reading Support In 2019, 55% of total eCommerce purchases will be paid by Cards. The Payment Type box shows the forecast of eCommerce customers’ payment preferences in each country and refers to the payment method share of the total gross merchandise volume per year. Here you can find more studies and statistics about "eCommerce".